Serve these meatballs as appetizers or a main course. In a large bowl, place milk and bread. Work with your fingers until bread is moistened. Add lamb and remainder of ingredients, and mix well. Heat grill. With slightly dampened hands, shape mixture into 32-36 evenly sized meatballs. Thread 4-6 meatballs on metal skewers or wooden skewers that have been soaked in water for 15 minutes to prevent them from setting on fire. 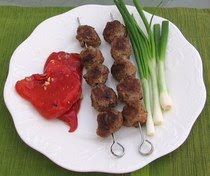 Lightly brush kebabs with olive oil and cook on a grill or under a broiler for 8-10 minutes, turning once during cooking. Serve with roasted red peppers, green onions and rice, if desired.